I’ve never been one to like the spotlight. I do much better in the supporting role, taking care of all the arrangements in the background. It’s what I’m good at, and I genuinely love being able to help people. But lately, I’ve found that I’m wanting to step out a little bit more. While my clothing has become more and more streamlined and minimalistic (more on that later), I’ve found myself reaching for a little more oomph everywhere else. I think I laughed it off at the time, but I thought about it a little more…and a little more. My taste tends towards simple, which I love and is definitely my style base. I like small studs, delicate chains, neutral eyeshadow, and lips with just a hint of color. I never really learned how to rock an arm party, and I prefer to wear only one ring on each hand, tops. I have more statement necklaces and more red lipstick than a neutral-loving girl should ever have, but those only make it to my final look either during the holidays or when I’m going to an event that requires a little more bling. 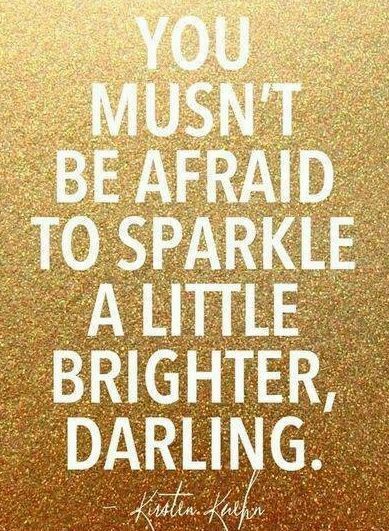 I don’t think that I’ll ever stop being more of a less is more type of girl, but there’s no harm in trying something different and moving out of your comfort zone every now and then because you can, and because every girl should sparkle, in big and small ways. I wore a red lip color all through this weekend, and after the initial adjustment period, I liked it…a lot. It brightened up my whole face, and I had so many compliments. Whether it’s wearing red lipstick or piling on the bling or something bigger like going after that promotion or taking the lead on a project, make sure you’re not holding back because you’re afraid you’ll look silly or that you’re trying too hard or that you’ll fail. You may do all of those things and then some, but so what? You could also find that you’ll shine a little brighter through the process.